2007 may not have been “the year of mobile marketing,” but with the iPhone launch and other under-the-hood improvements, mobile marketers moved past the experimental stage. 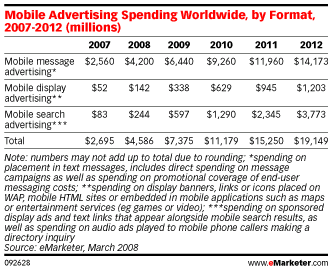 Still, compared to other interactive platforms, in 2008 mobile will remain small in overall spending. eMarketer forecasts that worldwide mobile marketing and advertising spending will reach $19 billion by 2012. Its good growth, but not great if you compare it with the total Global Ad Spend which should be between $600-750 billion. True market maturity will require huge investments of money, time, talent, and negotiation among brands, agencies, mobile carriers and mobile service providers. A recent report published by Screen Digest predicts that mobile media ad spending in the US will increase from $88 million in 2008 to $700 million over the next 4 years. The report, titled “Mobile Media Advertising Opportunities: The Market for Advertising on TV, Video and Games“, also predicts that more developed mobile markets, such as Japan and South Korea, would have higher ad revenues than the US for mobile TV, gaming, UGC and VoD services. Juniper research predicts that mobile ad spend will pass $1 billion in 2008 driven by mobile TV and reach $7.6 billion by 2013. The report also estimates that mobile TV will be the most lucrative service in mobile advertising by 2010 ($2.5 billion in 2013), while idle-screen advertising will become an important part of mobile advertising (reaching $500 million in 2013). According to Juniper, China and the Far East will remain the largest regional market for mobile adspend with revenues reaching more than $2.1 billion by 2012. Until critical issues such as lack of inventory, reach and common metrics are resolved, advertisers will not commit big budgets to mobile advertising. Data pricing structures, handset and mobile web usability, content quality and the lack of audience metrics to measure effectiveness are preventing mobile advertising from reaching its market potential. Although the promise of millions of iPhones and other devices to deliver a mass mobile media audiencein the US is great, it remains more promise than mainstream reality. Only 15% of responding ad executives in the Screen Digest study said that they had used mobile advertising. 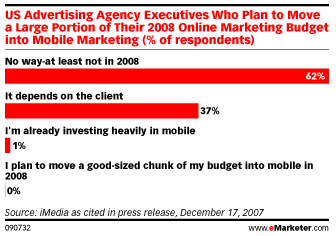 Similarly, more than six out of 10 responding agency executives in a December 2007 study by iMedia said they would not put a large portion of their 2008 online budgets into mobile. Adspend in the mobile environment will continue to be limited when compared to the budgets allocated to media such as magazines, television, cinema and the Internet, the opportunities it offers –personalized advertising with very high response rates, delivered to a device which is always in close proximity to the individual will make it an increasingly attractive proposition for leading brands. There remain clear growing pains ahead for mobile advertising. Better contextual targeting (for example, location, time, history) is a prerequisite for mobile advertising to succeed. But how to get there in the short-term remains the billion dollar question.